Cooking fish on the skin side, which protects the meat from direct heat, leaves it so moist and tender that I can’t quite imagine any other way to cook it. 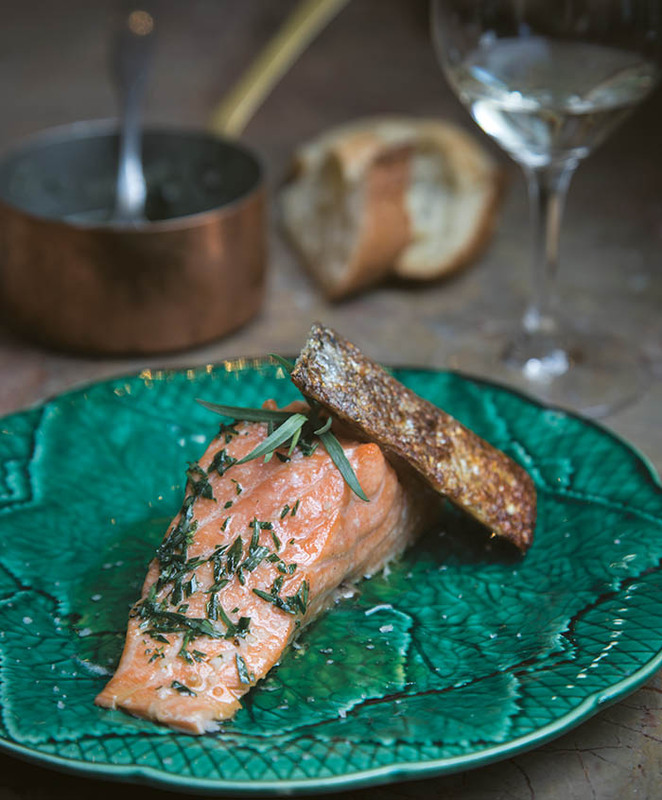 In the case of salmon, you are also left with strips of golden skin that are shatteringly crisp and delectable. To finish here, add a bit of melted butter, a squeeze of lemon juice, a shower of freshly minced tarragon, and voila! This makes for quite a lunch or supper, particularly when you serve it with basic grilled leeks and a chilled Saumur- Champigny. Always let fish sit for a few minutes after cooking, as it will give up juices that have little flavor. Pour away this juice; it dilutes any sauce that you serve and will make the plate unattractive. Also note that each serving here is 5 ounces (150 g), half of the salmon fillet per person. If you want a heartier serving, simply increase the weight of the salmon fillets. The cooking time should remain the same. 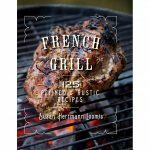 This recipe is ideal for a gas grill; if you don’t have a plancha, use a cast- iron skillet set on your grill. Light all three burners of a gas grill. Place a plancha on the grill; let it heat to blistering and the grill to about 425–450°F (220–230°C). Rub each salmon fillet all over with a light coating of oil. Put the butter in a medium heatproof pan and place it on the grill to melt. When the plancha is hot, place the salmon fillets on it, skin side down. The butter is most likely melted at this point, so remove it and keep it warm. Close the grill and cook the salmon fillets until they are opaque through, about 8 minutes; if they are almost but not quite opaque, remember they will continue to cook once off the grill. Slip a sturdy metal spatula between the meat and the skin of each fillet, and transfer the meat to a cutting board with a trough around it to catch the juices or a large plate or platter. Carefully remove the skin from the plancha— it will be golden and crisp— and reserve. Season the salmon with salt and pepper and let it sit for a few minutes so that the fillets give up their juices. Stir the tarragon into the melted butter, then stir in the lemon juice to taste. 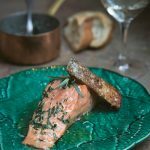 To serve, cut each piece of salmon fillet in half crosswise, and use a slotted spatula (so their juices don’t come with them) to transfer one piece each to the center of a warmed plate. Drizzle the butter mixture over each piece. Cut each piece of salmon skin in two, and balance each piece at an angle on a piece of salmon. Serve immediately.